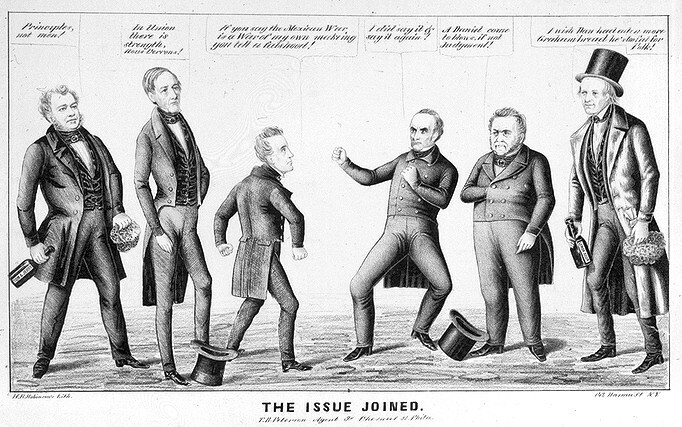 One reason I posted this was that I was very impressed by the apparent magic of predictive lithography: that back in 1846 these men could have pre-enacted political blogging so vividly. Had I seen this several months ago, “The Issue Joined” would have been the title of this blog. It would be helpful if you could also find out what the other men are saying! I assume that the 3rds (rubbing) alcohol and sponges in their hands. The one on the far right seems to have already sampled a bit from his bottle, by the looks of things! I also thought they were sponges, and it must be some sort of alcohol that they have. I haven’t been able to find a good clear image with all the words clearly legible. I’ll keep checking.